"They are awesome dogs with huge hearts ... hopefully Chunk can be one more pit bull that can show people who they really are." 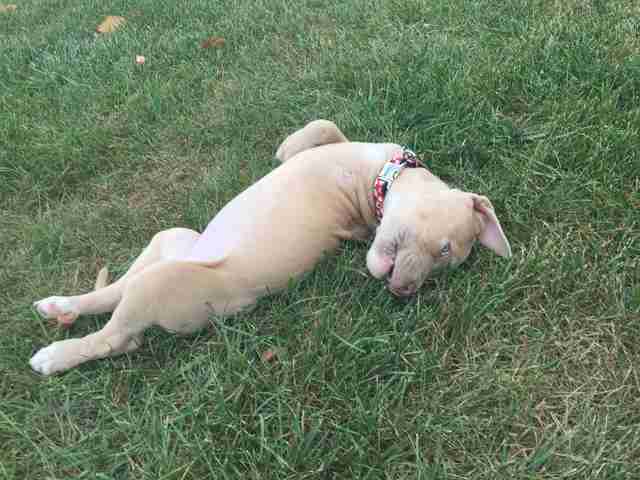 Chunk is a three-legged pit bull puppy who’s completely irresistible. "I'm just so in love with her," Chris Ryan, her foster mom, tells The Dodo. "She's just such a sweetheart." Chunk came along to Ryan at the perfect time. It's just one of many lucky turns for the pup. After 15 years of teaching, Ryan retired in June and had been looking for something new to focus on. She saw a picture of Chunk, who was in a foster home but would be going up for adoption, and a lightbulb went off. "This little girl is going to need so much attention," Ryan recalls thinking. "This is meant for me." 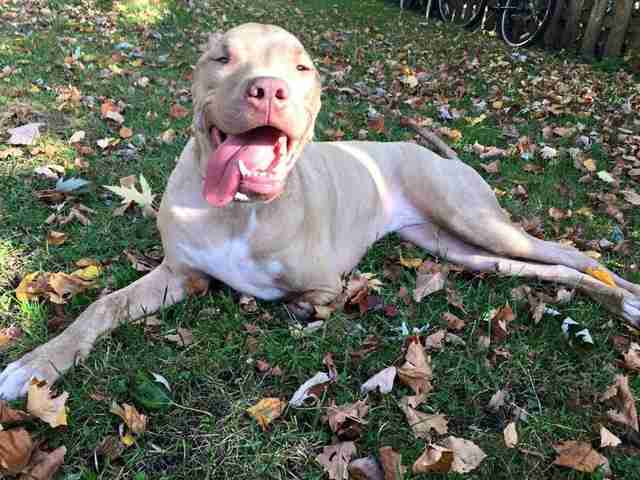 In late August, Chunk was brought to Chicago's municipal shelter by someone who said they'd found her on a sidewalk. 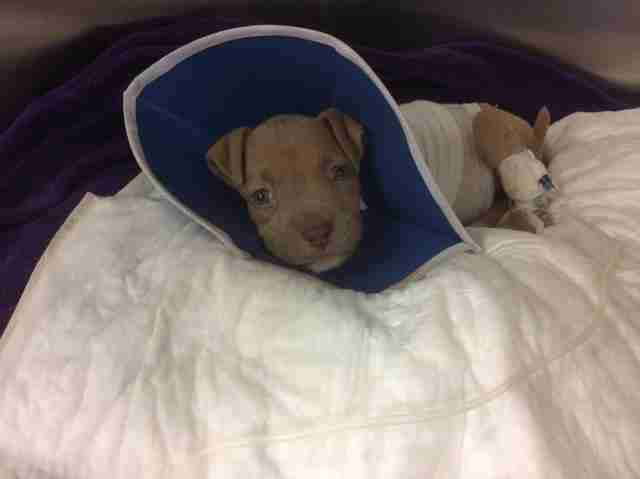 The young pup's front left leg was badly hurt, likely from an old bite wound. Volunteers with a group called Chicagoland Rescue Intervention and Support Program, or CRISP, were at the shelter that day, too. CRISP is a coalition of eight rescue organizations that work together to help prevent pets from winding up in the shelter. Usually CRISP does this by helping provide pet supplies and services. This time, Chunk was taken in by One Tail at a Time — one of the eight rescues — which whisked her right to an emergency vet. 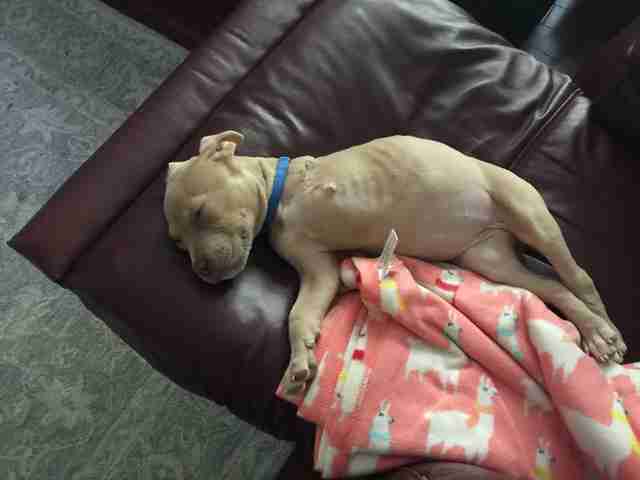 Vets said that Chunk's leg was too hurt to save, and that it put her at risk for sepsis and even death — so they made the decision to amputate it. 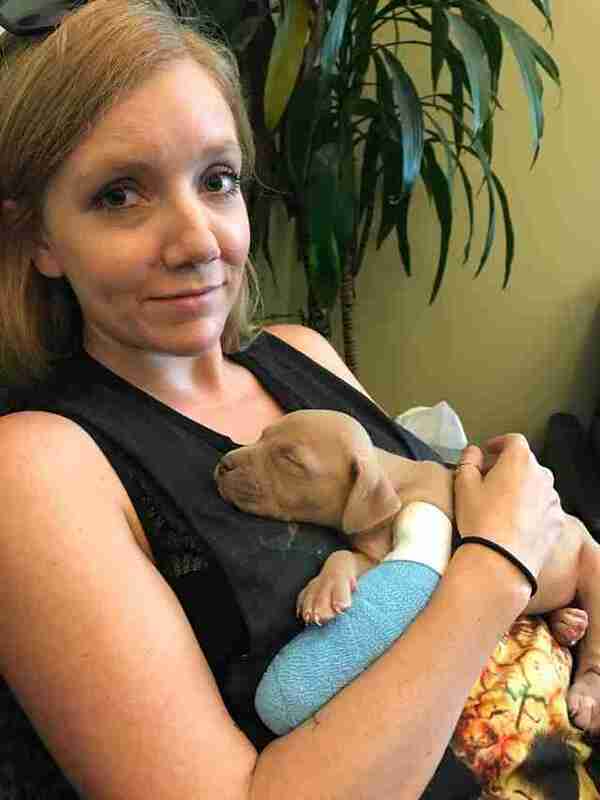 "We worked with Veterinary Specialty Center in Buffalo Grove, Illinois, who did the surgery for free through a program they have in which they assist rescues," Heather Owen, One Tail at a Time's executive director, tells The Dodo. Owen is grateful about something else as well: Chunk adjusted to her new situation so well she "was up and walking the next day. She is a whippersnapper and then some. She's feisty in the best way possible." 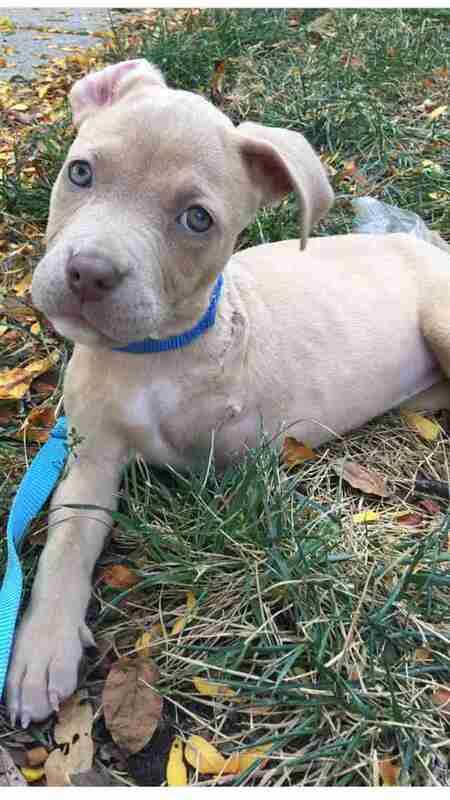 Chunk went into her first foster home from there, and her big personality just kept growing. Photos and videos of her antics were posted to the One Tail at a Time Instagram — that's where they caught Ryan's eye. Ryan applied to adopt Chunk. 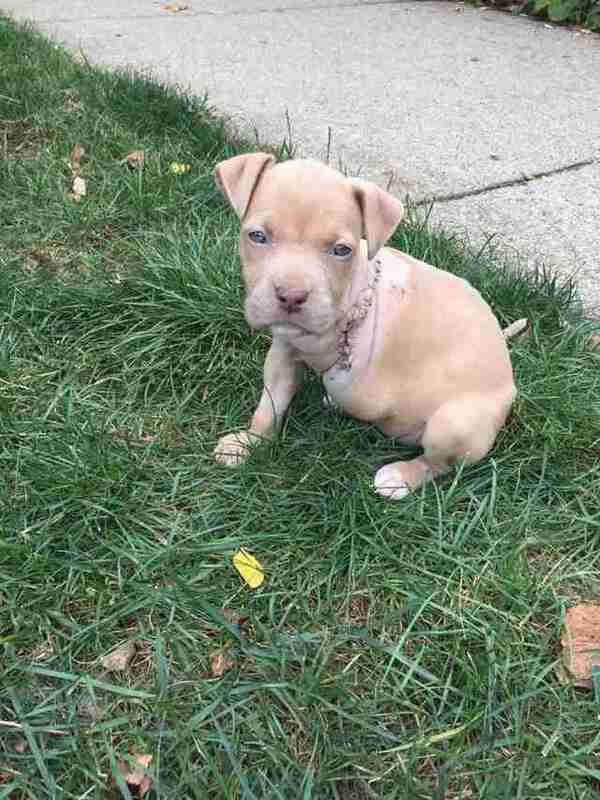 The little pupper isn't available for that quite yet — she needs to get big enough to be spayed first — but just over a week ago Chunk moved into Ryan's house in the Chicago suburbs as a foster-to-adopt situation. 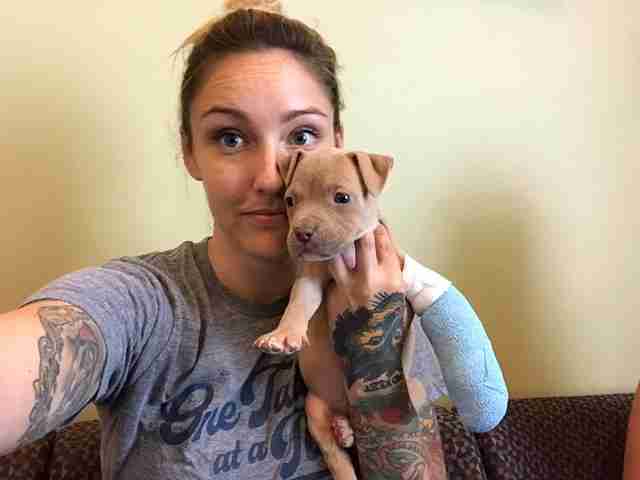 Ryan's daughter Stephanie McCutcheon is a volunteer with the rescue and mom to a three-legged pit bull herself. In fact, Ryan credits McCutcheon and her tripawd pittie for showing her how very wrong the negative stereotypes about pit bulls are. 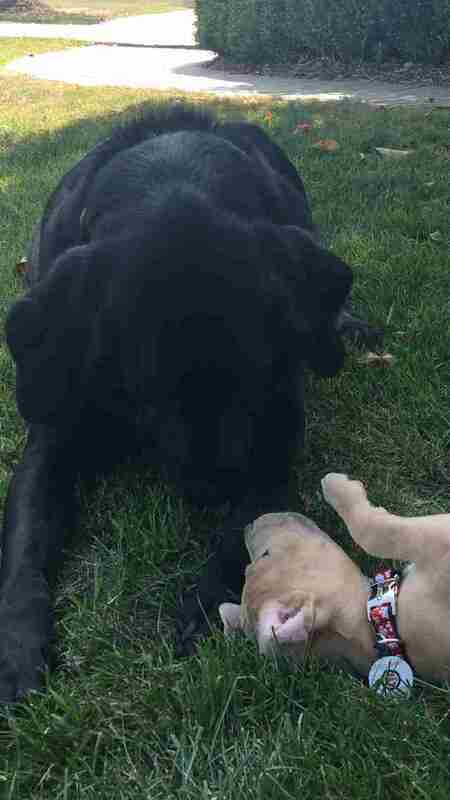 "In my opinion, they are awesome dogs with huge hearts, goofy personalities, great family dogs and the best cuddlers," McCutcheon says. "More people need to realize that and stop believing myths that are out there about them." She says she's proud of her mom, and excited for Chunk. "Hopefully Chunk can be one more pit bull that can show people who they really are," McCutcheon says. "Plus two tripawd pitties in the family is better than one!" Ryan is on board with that way of thinking. So is Chunk, who has made herself right at home. Ryan's husband, Steve, has also fallen hard. "He loves Chunk, too," Ryan says. "I just can't tell you how cute she is." 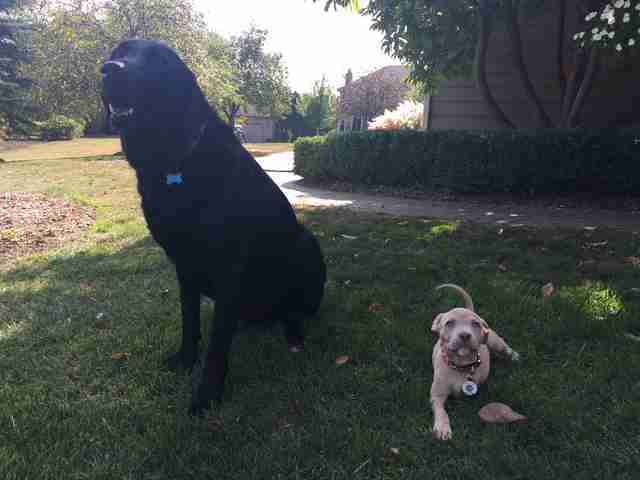 Owen says love stories like these are exactly why One Tail at a Time Exists. "To give second chances [to] the little Chunks in the world," she says. "Life can be tough. Chicago can be tough. The shelter can be tough. But there are people out there that care so much, that will give these animals a chance. 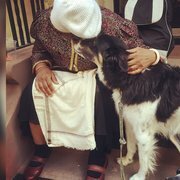 We love to connect those people with the animals that deserve a great home." Ryan marvels at the good fortune of this dog coming into her life just when she did. "She's so good," Ryan says. "She's so sweet." Follow One Tail at a Time on Facebook and Instagram. Here's where you can make a donation. You can also buy a T-shirt featuring Chunk — sales benefit One Tail At A Time.